Brittany has to be one of my favourite destinations. 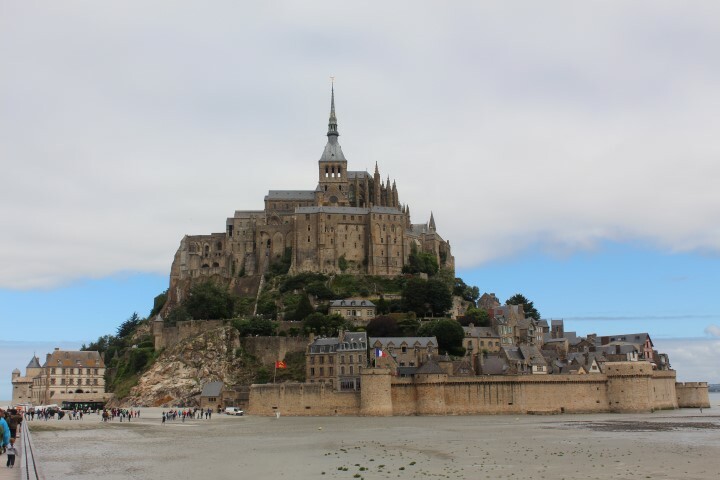 On this holiday we were making our way through Normandy in order to get there, and so it was an obvious point on the route to include the marvellous Mont St.Michel. Somehow I have always managed to get to the French site, but have never managed to get to the English counterpart – St. Michael’s Mount. Just one of those odd things. 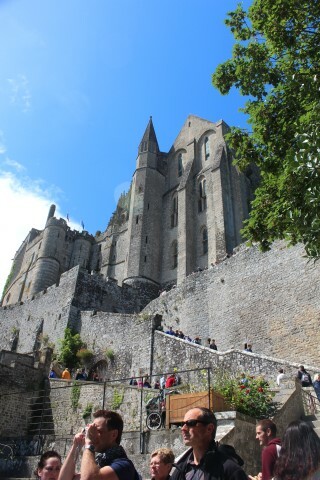 Another odd thing is that I don’t think I will be going back to Mont St Michel for a while. It’s not the place itself, it’s the way that you are now made to feel like a factory farmed animal and are herded onto buses with bored drivers, miles away from the village in order to be unloaded close to the entrance. It’s efficient, and it’s free, but it’s so de-humanizing. I’m sure it’s better all round for those who live there, and even for those who visit, but… well, it’s not something I want to undergo too often. 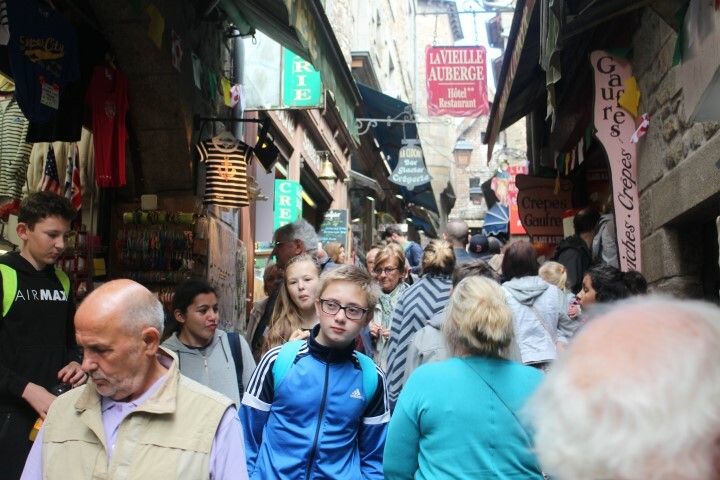 The narrows streets up into the site itself were as congested and chaotic as a Marrakesh souk. I stood back to feel the energies of the crowd as they milled about. It was a polite tumult reminiscent of a busy city on a weekend. People were walking around with a vagueness doing that “scanning for something to waste my money on” type of look. Most parents were doing the opposite, scanning around for ways to distract their kids from latching onto any old tat which dangled at their height and caught their eyes. I decided to blend in and look like I was looking too. Soon I had spotted a short sword which I knew I would have to buy on the way down. Dammit! Consumerism is powerful! We made our way to the top straight away, standing in line with the other tourists, buying the same tickets, looking at things through a camera lens instead of with our eyes. Once inside the main building, however, I switched all that tourist mode off, and began to allow for the sensing of any interesting energies which might draw my attention. I was interested to see if the energy centres which had drawn me last time would be the same ones which would catch my eye today. 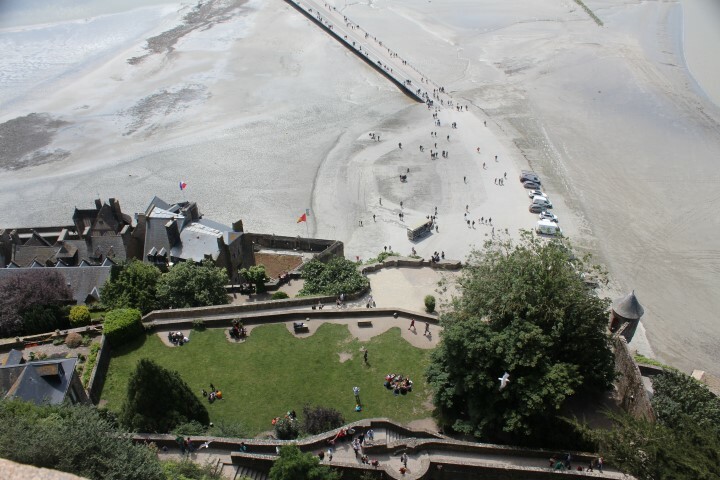 Before long we were at the top, and feeling the cooling breeze of the exposed esplanade with its crenellated walls. The sun was blazing this July, and it was delightful to feel the power of its rays on contrast to the gloom and artificial lighting of the inside spaces. We stepped into the inner sanctum to find that there was a service going on. This was a chance to explore the power of ritual. I stood discretely to one side and began to connect to the energies of the participants, particularly those officiating at the ceremony. 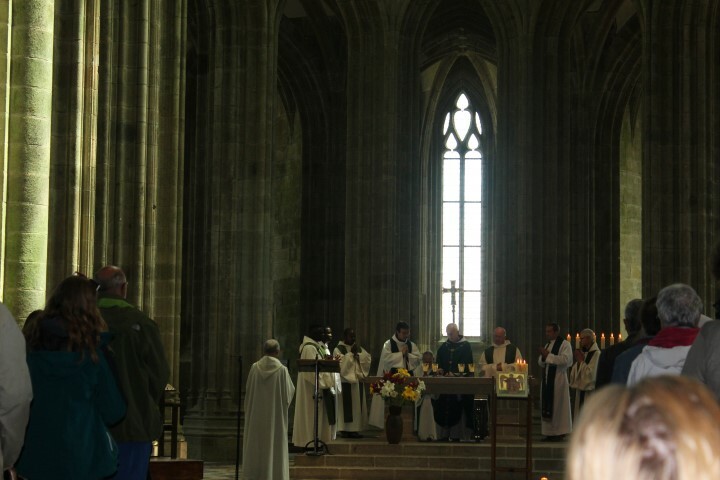 I could see energy “glows” around the main clerics, and some of the nuns too. When I closed my eyes I discovered that the sound of the chanting was operating at different levels of my energy body. As the chanting changed in pitch it worked through several of my chakra points, resonating at different frequencies as the tones changed during a service. I could feel how the architecture of the space enhanced, amplified and helped form the sounds for this purpose. As the ceremony ended and the participants dispersed I switched my focus to a more general investigation of the space. Now I was working by intuition, instead of dowsing for the answers as I had the last time I was here. My attention was thrown over to the opposite nave which was cordoned off – yes, this was still the area with the strongest power centre in the entire area. This was the heart of Mont St Michel’s power. If only I could get unfettered access to it, and could explore properly! We moved on. The gardens in the cloister were still beautiful, and the carvings are remarkable, but we moved on. Further along the tourist route we came across an inlaid design – one of several in a room – but only one design had any power. It was the only one which was defaced and poorly restored, yet it had power which M noticed straight away too and remarked upon. 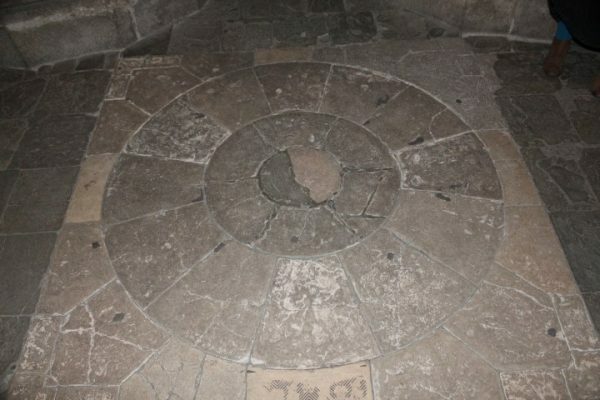 We stopped off in the Templar room (The Salle Des Chevaliers) and we both walked an intuitive path around the columns which filled the room in two ranks. I wove in between them all noticing how the energy was stronger where few tourists walked, and much more disrupted and weaker where the main path crossed the space. Most people simply walked through the room, but a few seemed to sense the power of the space. When I had finished the walk I felt I understood the purpose of the room – it was a place to find your way. In so doing, you found a new power. 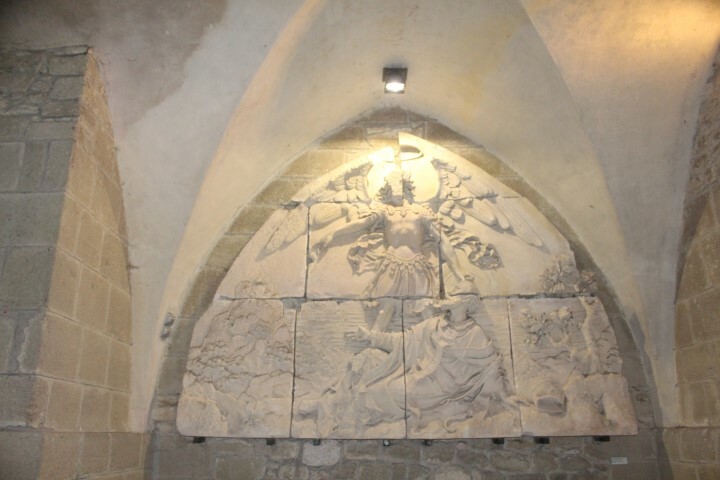 Finally, we came down to the base of the mountain retreat and began to encounter images of Archangel Michael. I felt so strongly drawn to these images, and felt like I was re-affirming my connection with this powerful energy form. It was unexpectedly strong and emotional. With that, we were back out in the open, and the lure of a restaurant selling french cider and with a stunning view was too much to hold out against. We became tourists again and gladly so. At least for now. Soon, we would be heading off to meet with Oona Gewlloch – the Druidess of Brittany and amazing artist. And what an encounter that would be!